At least two of the following salad items: red, yellow, orange or green peppers, cucumber, tomatoes, olives, spring onions. *Before the session cook the spaghetti and potato faces following the packet instructions. You will need approximately 1 oz of dried spaghetti per person. Add a little olive oil to the cooked spaghetti to stop the pieces sticking together. Allow the spaghetti and potato faces to cool completely. Make sure the surfaces in your area are clean and encourage the children to wash their hands. 1. You may need an adult to help you with this stage - choose a selection of salad items and carefully chop them into small pieces using a dinner knife. Place the salad in a bowl and (if using) add a little salad dressing. 2. Place your cooked potato face in the middle of your plate. 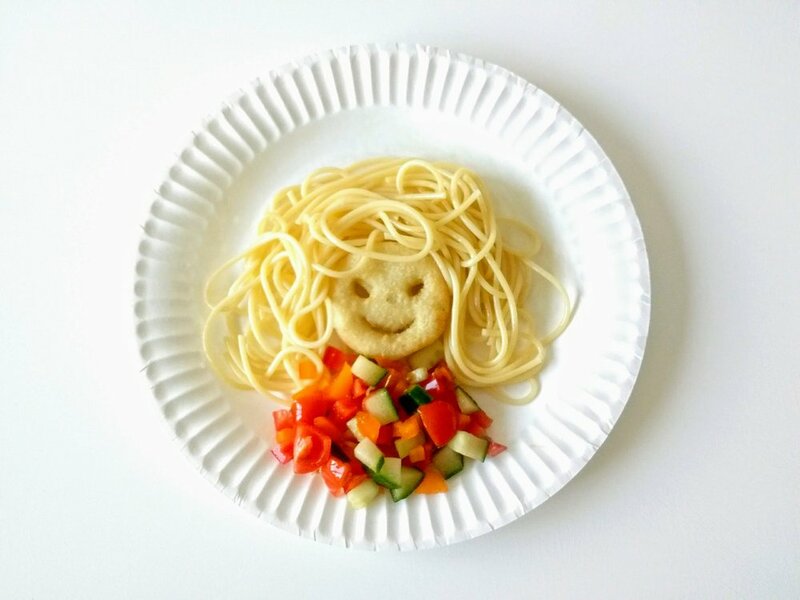 Arrange the cold pasta around the potato face to look like Samson with long spaghetti hair! 3. Place your prepared salad below the face to give Samson colourful shoulders.